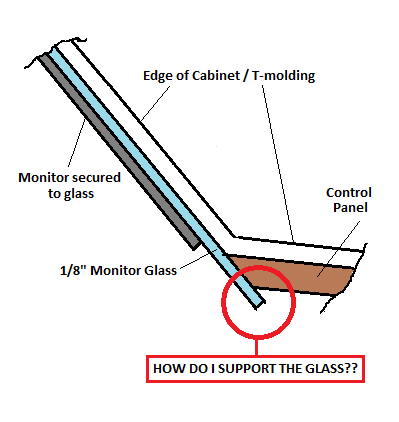 Best way to support Monitor Glass? 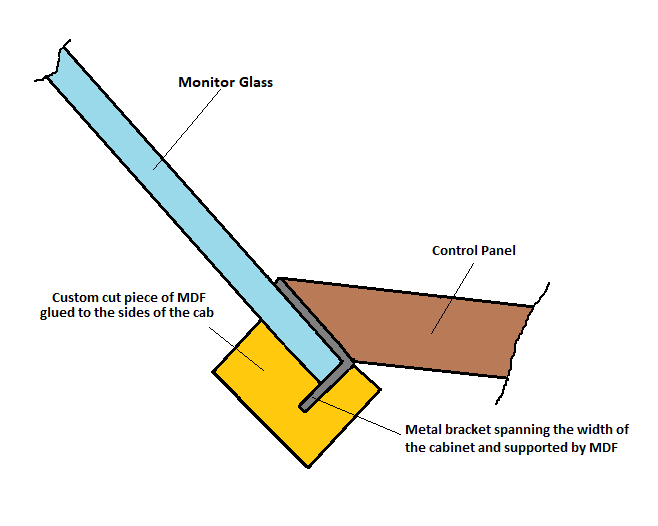 Re: Best way to support Monitor Glass? Maybe you could use a wider glass panel, route a groove into the inside of each side panel and just slide it in. I'm sure there's multiple ways of doing this, even in factory cabinets. Here's a video from a Simpsons cabinet (part about glass starts at about 8:58). Basically, it slides into a slot opening at the top, and it rests on a wood brace mounted on the bottom. 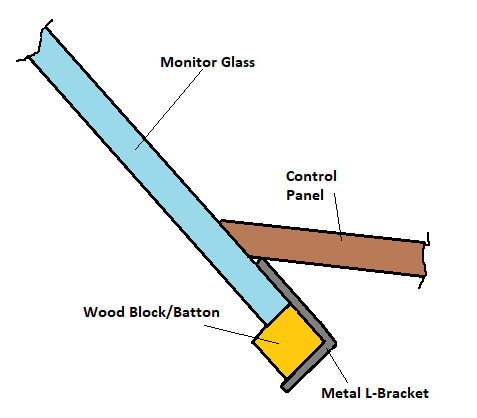 An angled metal bracket holds the glass in place, secured by a screw. This is what I did in my TMNT cabinet. SHorter glass and longer CP overhang ! Thanks for this! I think I can do something along these lines. Anyone got any more pics/ideas? Maybe add a wooden brace/bracket ( Can't think of the name of them right now - but those wooden braces you use to screw/glue the rest of the cabinet to ! ) to each side so the glass rests on them. Battons? That's a good idea... Like this? No real need for the metal bracket -- just cut a 1/8" groove into the battons that you place on each side of the cab - so that the glass will slide into the groove and the batton is attached to the side of the cab - that way the battons are held in place on each side of the cab and the glass can sit in the groove on the batton so will stay in place. Thanks for this. I think I've worked it out based on your sggestion. What do you think? Thanks for this. I think I've worked it out based on your suggestion. What do you think?